This beautiful home in the upscale Winter Creek development was built in 2007. It is fully furnished with all new comfortable contemporary furniture, artwork, lighting, bedding, linens, and many decorative accents create a distinct sense of style and warmth when you walk through the door of our Wintercreek Mountain Delight. Relax in the beautiful living area while watching TV or enjoy your family and friends by the fireplace, if cooking’s in the plans, our fully equipped kitchen won’t disappoint, have a formal dinner at our dining table that seats 6, or enjoy an outdoors dinner on one of our decks, the choice is yours. This vacation home features 3 bedrooms and a fully equipped office, the master is located on the first floor along with the office, 2 more bedrooms are on the 2nd floor, with plenty of space to spread you’ll love our Wintercreek Mountain Delight. Also just down the street is the Ponderosa Golf Course. 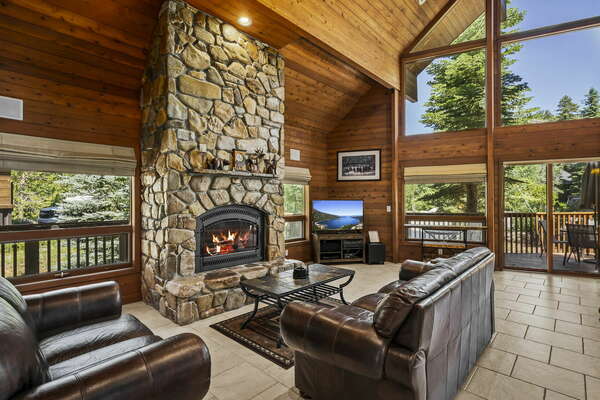 Whatever the season, our Wintercreek Mountain Delight Vacation Home in Truckee awaits you!! !